My spiffy new Fujitsu laptop has some special buttons that can be set to launch programs. The utility for setting these lets me choose programs from the Start menu. 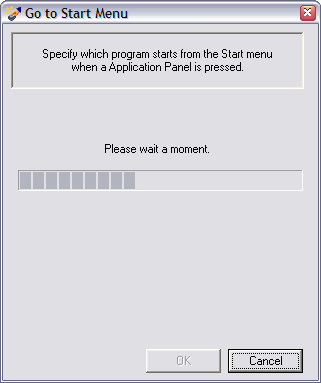 Here's a screenshot of it finding those Start menu programs. #1 Why does this take so long? No matter how politely, don't ask me to wait a "moment." This is going to take longer than a moment. If it's only going to take a moment, you don't have to tell me about it because I won't notice a moment going by. If it's only going to take a moment, you don't have to create an entire screen with a very long progress bar. Tell the truth. This is going to take quite a while, isn't it? I'm going to curse you for how long this takes, aren't I? You're going to make it very clear how something that really should take only a moment takes, in fact, nineteen seconds of my life and attention. In those nineteen seconds, I may rethink my life's ambitions, consider a new career path, begin work on a fabulous opera, hunger for real Cordon Blue instead of the crappy frozen stuff from Stouffer's. Never mind that you don't show the utility on the task bar, making me minimize other windows to find it again. Or that you advise, like an ignorant illiterate, "when a Application Panel is pressed," instead of "when an Application Panel button is pressed."